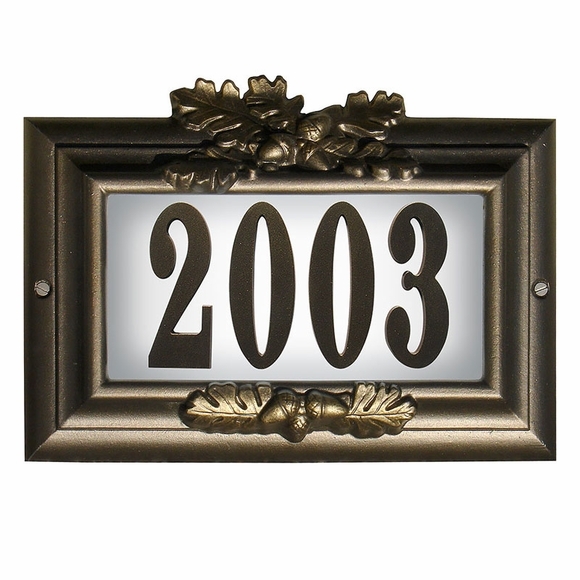 Personalized Lighted Home Address Plaque - - decorative cast aluminum frame personalized with your house number. Holds up to four 4" vinyl or cast aluminum numbers. Two light bulb styles available: standard 3-watt incandescent bulbs or brighter, energy-efficient LEDs that use less power and last longer than incandescent bulbs. Please note: LEDs need between 18v-20v to operate properly. If you have lower voltage, use the standard bulbs (included) instead. Attaches directly to your existing doorbell system. Durable cast aluminum construction won�t rust or rot. Dimensions: 13.75" x 9.5" x 2.75". Finishes: bronze (shown above) or black. Note: If you are hanging this address plaque in a spot without access to a transformer, you will need to purchase and install either a plug-in or hard-wire transformer (sold separately, item 67029F, see Related Products).